Aimed with improving the workflow at woodworking shops, Safety Speed Manufacturing and Conquest Industries reintroduce the All-American Work Cell, an all-in-one manufacturing cell for woodworkers everywhere with a new Work Cell Wednesday feature. Utilizing the work cell at the 2018 International Woodworking Fair in Atlanta, Safety Speed and Conquest Industries created and donated bookcases to the Atlanta Mission, a 501(c)(3) organization serving Atlanta’s homeless population. 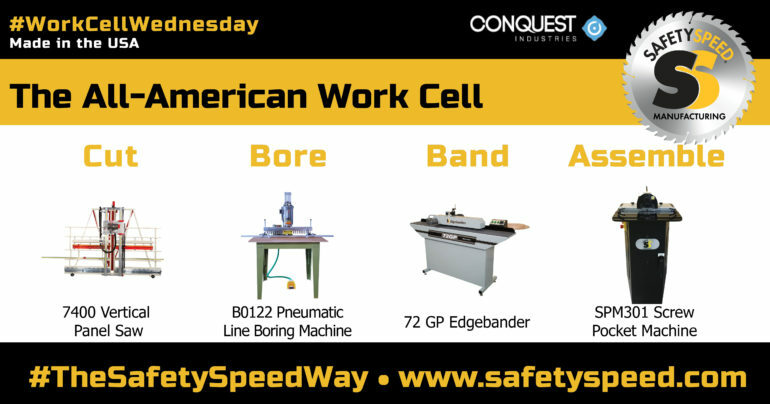 Check back each Wednesday for the latest edition of Work Cell Wednesday as we take an in-depth look at the components making up the All-American Work Cell. Please fill out the following information. Someone from our office in Minnesota office will contact you shortly.